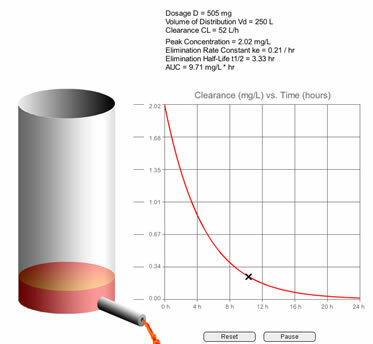 Based on exact solutions, this deterministic simulation of a single compartment pharmacokinetic model includes a hydraulic analog to facilitate visualization of the response to a bolus injection. The height of the meniscus, the cross-sectional area and the size of the drain aperture are user adjustable and correspond to the drug concentration, the volume of distribution and the clearance rate respectively. This simulation also comes in a ‘Re-Purposable’ version. This means that you can edit text in the text fields for different labels to customize the simulation to other processes (for example, charging of an electrical capacitor) and scenarios that can be characterized as first order systems.